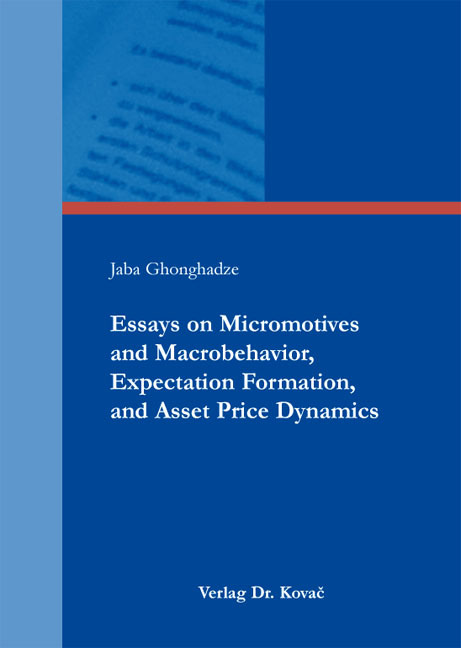 Essays on Micromotives and Macrobehavior, Expectation Formation, and Asset Price Dynamics. Dissertation von Jaba Ghonghadze, Verlag Dr. Kovač 2013, 382 S.
This work collects the author’s recent investigations in interactions-based approaches in economics and finance that he undertook as a doctoral candidate in the program ‘‘Quantitative Economics‘‘ at the University of Kiel, Germany. The study is arranged in three parts and it contains seven chapters. The idea of the first part, a potential conflict between micromotives and macrobehavior, is reflected in two chapters. Chapter 1 is devoted to the formalization of Schelling‘s (1971a) seminal Bounded-Neighborhood Model. The main theme is segregation. Three theorems are obtained in a simple setting where agents make discriminatory choices. While the author confirms the persistence of segregation in the first two results, the third theorem is quite new in that it identifies the mechanism that makes integration a stable equilibrium a surprising outcome that has been overlooked by many scholars. Chapter 2 sets up an environment in which it is possible to get an aggregated pattern that has no counterpart at the level of an individual. The main theme is the aggregation of individual single good demands into the market demand under a variant of a dual decision hypothesis that once has been formulated by Clower (1965). It is shown that despite the fact that individual demands stay downward sloping, the aggregate demand might display upward sloping regions for certain price segments. Part II, consisting of Chapters 4 and 5, addresses the issue of the economic modeling of expectations formation. Chapter 4 is based on the author’s joint work with Professor Thomas Lux. It estimates a simple univariate model of expectation or opinion formation in continuous time adapting a `canonical‘ stochastic model of collective opinion dynamics (Weidlich and Haag, 1983; Lux, 1995, 2009). This framework is applied to a selected data-set on survey-based expectations from the rich EU business and consumer survey database for twelve European countries. Agent interactions are modeled via the Master equation approach. The authors find interactions to be `strong‘. The adopted modeling approach shows superior out-of-sample predictive power when compared to that of the benchmark time series models. Chapter 5 is based on the framework of Chapter 4 and investigates the predictability of European consumer confidence indices based only on particular sentiment indices. The analysis is done for the case of UK. This chapter is a step forward in an attempt to merge psychological factors with the macroeconomic fundamentals. The model parameters in Chapters 4–5 are estimated through maximum likelihood and numerical solution of the transient probability density functions for the resulting stochastic process. These density functions are the solutions to Kolmogorov‘s forward or Fokker-Planck equations. Part III deals with the issues of modeling asset price dynamics in financial markets. It comprises three chapters. Chapter 5 postulates three simple one-dimensional continuous-time diffusion models of asset price dynamics. The novelty is the particular shapes of the diffusion functions which come in two specifications. They both share the property that the diffusion functions display `curvatures‘. Besides, the functions originate in zero for all parameter values. The author’s analysis leads to the formulation of the `volatility curvature hypothesis‘. Chapter 6 offers an extensive Monte Carlo study of Model I. It reveals indeed surprising hidden properties of the model. In particular, it shows that a strictly stationary univariate Ito-diffusion, Model I, without jumps, with inaccessible boundaries, and uni-modal stationary distribution is capable of generating price series and log-returns with the following properties: (1) Even though price series are mean-reverting, they might look like a random walk; (2) Implied log-returns do not follow a predictable pattern and appear to be quite random; (3) Log-return series display pronounced volatility clustering; (4) The distribution of log-returns is highly leptokurtic and displays power law tail behavior stretching over tens of standard deviations; (5) The unconditional moment properties of log-returns might be disconnected from those of the prices in an unconventional way; (6) Option pricing exercise reveals the presence of pronounced ``volatility smiles‘‘; and (7) These effects come without (a) any inclusion of jumps, (b) a priori embedding of GARCH features, or – bi-modality of price distributions. Apart from these, Chapter 6 identifies five reliable estimators well-suited for Model I, two of which are new in the finance literature. To show practical relevance of Model I, it is applied to the Microsoft share price dynamics in Chapter 7. One important insight is that the possibility of `crashes‘ is naturally implied by the theoretical model. Appendix contains many technical and useful results. It includes proofs and also supplements to some of the chapters. Overall, this book offers the reader an interesting journey through different topics, formal models, and attempts at novel solutions of some old problems.